One of my favorite tools that I use on my Walks are ukiyo-e woodblock prints. They are also a passion – I love looking them, their style, bold colors, and atmosphere. I also love being able to walk in the very areas where these were first created and often being able to see the same vistas. In a city whose physical history has been largely destroyed by countless fires, earthquakes, and war, ukiyo-e prints are a great way to pull Tokyo’s hidden past to light. They allow me to make that history more accessible and connect to it in a more physical sense. I have also come to realize that what most see when they look at this iconic Japanese art form is vastly different from what I see when viewing the same print. I imagine that the same holds true for the aficionado of American Civil War photographs or fans of Renaissance clothing and fashion. What most would see simply as cannons strewn across a field or ruffed collars and gaudy hats, the fan of each would see in each details that would allow them to identify era, time, and place. Similarly, mistakes in labeling them are bound to get a sharp response not only pointing out the error, but wonderment at how such a blunder could go unnoticed. This print shows the shoreline at Takanawa, now a suburb of Tokyo and home to Sony. In the 1860’s it was a rural area as the print clearly shows. Two points in these sentences got my attention. The first (“…Takanawa, now a suburb of Tokyo…”), is an error made by someone clearly not familiar with Tokyo. Takanawa is in Minato Ward, one of the most central of all Tokyo’s wards, and inside the Yamanote line, the loop line whose circumference encloses the area commonly defined as central Tokyo. The second is less obvious, particularly to the modern viewer. “(I)t was a rural area as the print clearly shows.” The author probably made this statement based on the fact that an ox looms in the foreground. However, in reality the area depicted in this print was far from a rural area. It was actually one of Edo’s major ports and distribution centers. And that point is what prompted this post (and future posts in a series). 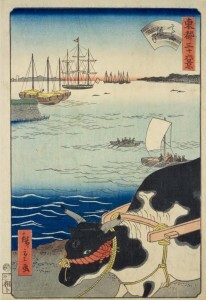 A viewer living at the time that this work was made would know almost instantly that the area shown was Takanawa, not only from the ships in the bay, but most especially because of the ox – this area was known officially as “Kuruma-cho” (Cart Town), but generally and usually called “Ushi-machi” (Cow Town). The area got its name as a result of the large number of cattle/oxen – as many as 1,000 head at its peak – that began to be based here during the construction of one of Zojo-ji Temple’s halls in 1634 and again in 1636 for the construction of the stone ramparts for Ichigaya Mitsuke on the outer moat. The cattle were needed because prior to this, there were no means in Edo for moving the lumber and stone needed for these construction projects. 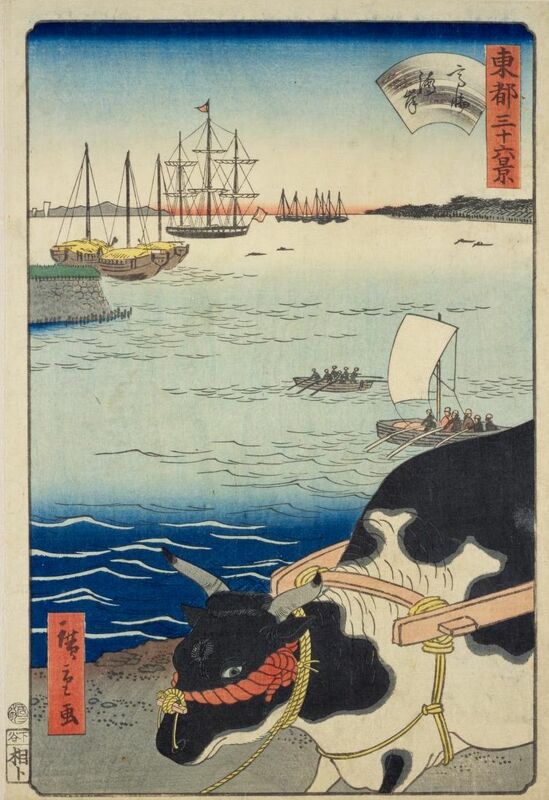 Cattle dealers were summoned from Kyoto and after the construction was completed, as a reward for their work, they were permitted to settle in the area and given exclusive rights for operation of ox carts for conveying heavy loads. This print also provides an interesting historical glimpse into an Edo and Japan beginning to undergo a monumental change. In 1853, Commodore Matthew Perry arrived in Uraga, at the mouth of Tokyo Bay and then a year later, returned again to establish a treaty that opened Japan to the world. This print, made just three years after that momentous occasion, shows a Western three-masted ship in the bay off of Takanawa. While its identity is unclear, it looks very similar to one of Perry’s sloops-of-war or a whaling ship of the era. “Cow Town” also lay astride the Tokaido, one of the Five Highways that linked Japan, and which connected Edo and Kyoto. 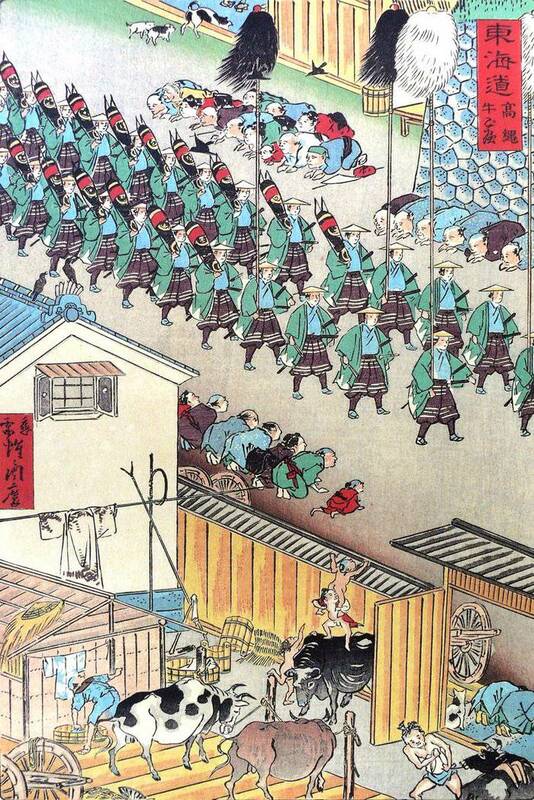 Because of this, it saw many daimyo processions on their way into or out of Edo as part of the alternate attendance system. Another print of the area, by a different artist, shows such a procession, and it is interesting to note the use of cattle to further identify the area. Once again, someone living in Edo at the time and looking at this work was would recognize the location right away. That recognition adds another layer of interest, an “Ah ha!” moment, to the time warp factor of ukiyo-e based in and around Edo. It lets the modern day viewer get a perhaps a small idea of what the purchaser of a woodblock print during the Edo period thought when looking at the same print, and make a connection through the years. This post will be the first in a series that will look at ukiyo-e prints and “reveal” some of the hidden (to the modern-day viewer, but apparent to the resident of Edo at the time) elements in order to read more of Tokyo’s past through these marvelous works of art.